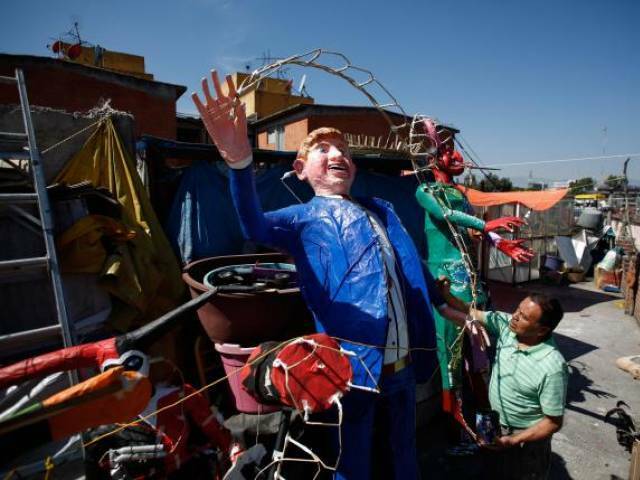 MEXICO CITY: Mexicans celebrating an Easter ritual late on Saturday burnt effigies of U.S. Republican presidential hopeful Donald Trump, whose anti-immigrant views have sparked outrage south of the American border. In Mexico City’s poor La Merced neighborhood, hundreds of cheering residents yelled “death” and various insults as they watched the explosion of the grinning papier-mâché mock-up of the real estate tycoon, replete with blue blazer, red tie and his trademark tuft of blond hair. Media reported that Trump effigies burned across Mexico, from Puebla to Mexico’s industrial hub Monterrey. “Since he started his campaign and began talking about immigrants, Mexico, and Mexicans, I said ‘I’ve got to get this guy,'” said Felipe Linares, the artisan who crafted Trump and whose family has been making Judases for more than 50 years. Trump, the front-runner to win the Republican nomination for the November 8 election, has drawn fire in Mexico with his campaign vow to build a wall along the southern US border to keep out illegal immigrants and drugs, and to make Mexico pay for it. Mexican President Enrique Pena Nieto has said his country will not pay for the wall and likened Trump’s “strident tone” to the ascent of dictators like Adolf Hitler and Benito Mussolini. Judas effigies are burnt in villages and towns in several Latin American countries such as Venezuela and in parts of Greece. Anthropologists say the practice serves a symbolic function to overcome divisions and unite communities around a common enemy. Linares has also done mock-ups of corrupt former union leader Elba Esther Gordillo and President Enrique Pena Nieto, whose popularity has been hit by conflict-of-interest scandals and the disappearance of 43 students at the hands of corrupt police.